Students discover the relationship among gas volume, temperature, and pressure. Students discover the gas laws (Boyle’s, Charles’ and Gay-Lussc’s), which are simple mathematical relationships between volume, temperature, and pressure. Since gases are usually invisible, they cannot be observed as readily as a solid or liquid and are often examined and analyzed through some measureable physical characteristics of the gas. By varying one component, students can measure the effect on the other three. Properties such as volume, pressure, temperature, and moles (number of particles) are important in describing gases. It's also important is that these characteristics have some consistent mathematical relationships that led to the development of the gas laws and, eventually, the ideal gas law. This kit enables students to measure and plot measurable characteristics of gas. Temperature and pressure sensors are needed but not included. 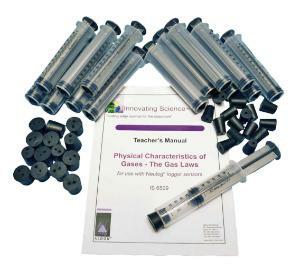 Ordering information: Materials needed but not included are temperature and pressure sensors.